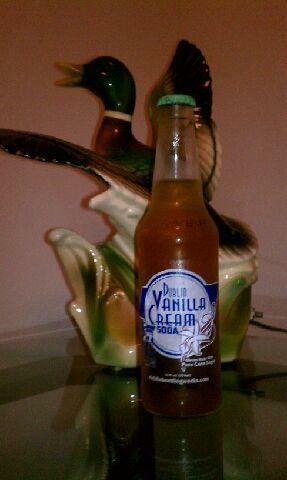 I like the retro bottle of Dublin Vanilla Cream soda. Also, I like the smell, and the color is good. I think it has the "proper" amount of sweetness and carbonation. I found the initial flavor very "vanilla-ey," with a lingering vanilla taste. However, over time, the flavor became mediocre. The vanilla taste seemed to fade a bit. However, it's a good soda. Buy a bottle. The bottle of the soda is done in retro style, which neither attracts nor repels me. The soda is the color that I expected for Cream Soda...amber. The first sip nearly knocked my taste buds sideways. It was very strong...but I never decided WHAT was strong. I thought this fabulously cane-sweetened soda tasted almost artificially sweetened. After drinking a few more sips, I thought maybe the flavor was what tasted artificial. At any rate, *something* about the taste tasted slightly of chemicals. This was an "okay" soda, so I suggest that you buy a bottle. Double Verdict – Buy a Bottle!